ESPN basketball analyst Dan Dakich lowered himself to retired Auburn football coach Pat Dye’s pompous level last week while he worked Michigan’s win over Michigan State in Ann Arbor. But that’s not all. Dakich stooped lower with Twitter comments posted prior to working Tuesday night’s Ohio State-Michigan State game the Spartans won before the Izzone student section in East Lansing. I’ll let Michigan State coach Tom Izzo, who wants an apology from Dakich, speak in his own words later in this story. No, Dan, they were written by people broader-minded than you that understand trickle-down poor sportsmanship. They were written by people that aren’t in the bubble of big-time college basketball. The bigger picture they consider is kids at the high school and youth levels copying what they see on TV. Pro athletes and college athletes that showboat flash a green light to unformed kids to imitate immature behavior. That presents a challenge to high school and youth coaches to explain such behavior is unacceptable. Every Dakich-like comment promoting bad behavior from a TV broadcaster makes the job that much more difficult. Those coaches work harder for less money (if any at all for some) than you, Dan. You’d know that, Dan, if you got outside your bubble. Didn’t you see Michigan Coach John Beilein yelling at Wilson nose-to-nose after the technical? Beilein knows. That brings us to Dakich’s cheap-shot Twitter posts that belittled Michigan State fans and students and favored Michigan. They seemed odd comments coming from a former Indiana player until you learn Dakich’s son is on Michigan’s basketball team as a redshirt. Then they sound like those of a Little League parent. “Before I go into anything, I have to tell you that I do a lot of work to try to somewhat control the Izzone. If there’s some things not being said, I email them and talk to them, and catch hell both ways – if too much is being said, if not enough is being said. But, I have to be honest with you. 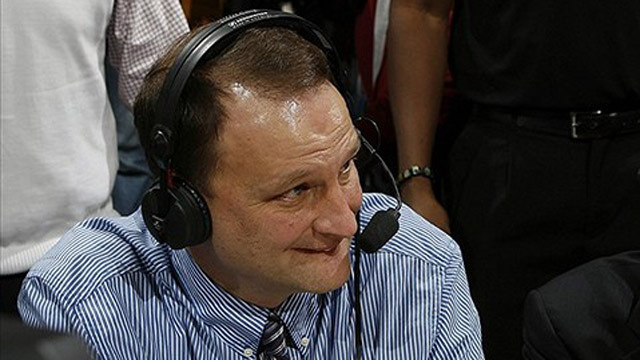 I was kind of getting upset at the chants of Dakich…until I got in the locker room. I asked, ‘What was that all about?’ And somebody read me his tweets ... The social media. “If I would have known that before the game, I would have embarrassed myself almost as much as he embarrassed himself and I would have led the chants. Because calling us whiners and that is kind of unprofessional. Classy broadcasters like George Blaha and everybody else wouldn’t have even thought to do something like that on TV. But, saying our students couldn’t get in there? And he’s doing games for Michigan when his son is there? That is a disappointment and that is ridiculous. “I think it’s funny because I have no respect for him for that and I am going to publicly say that. You can tweet it, you can read it, you can do whatever you want with it. But Twitter got him in trouble and he earned it. I am surprised that ESPN would let someone say something like that, that works for them. That’s off my chest now, another one for Twitter. Dakich is insightful when he sticks to X’s and O’s, but he can learn a thing or two from Naismith Basketball Hall of Famer Bill Walton, a fellow ESPN broadcaster. I remember watching Walton work Arizona games when his son Luke played for the Wildcats. Walton not only didn’t favor Arizona at the opponent’s expense, he was harder on Luke than anyone else. Maybe the difference has something to do with their respective college coaches. Walton learned at the knee of the gentlemanly John Wooden and Dakich from the often petulant Bobby Knight. Can we get Walton to replace Dakich on future Michigan State ESPN broadcasts? Izzo and the Spartans deserve mature commentary. Follow Tom Shanahan of FanRagSports.com on Twitter @shanny4055.